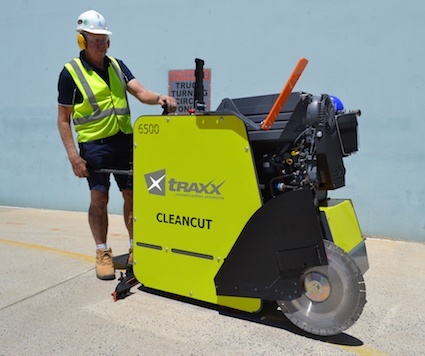 The managing director of Traxx Construction Products in Australia, Lloyd Williams has announced that a new range of flat saws will be introduced in early 2018. “Not since the mid 1990’s has anyone taken the challenge to build such items in Australia. Financially it has just not been viable,” said Williams. A local manufacturer Cleancut Construction Products has taken up that challenge. Cleancut’s managing director Bob Irvine, formerly the owner of a specialist sawing and drilling company CQ Drilling, won a contract to cut carcinogenic carbon anodes at a Queensland aluminium smelter. The project called for an extremely serious slurry control, with the 100% clean-up being a mandatory condition. To assist in the smelter contract, Irvine set about designing and building a high-performance slurry guard for his sawing machines. Eventually the guard he developed went on to become a finalist in the Australian Innovation Challenge in 2011. Global players of the concrete sawing industry, however, showed only a lukewarm interest in incorporating Irvine’s design into their existing products. Undeterred by this setback, in 2015 Irvine and his team set about building a sawing range incorporating the slurry control guards. The Australian Government helped fund the project through a commercialisation grant awarded in 2016. The result is two machines, now in final testing. Both the FS6500 and FS7500 models feature a four-wheel drive and a patented technology that requires minimal lifting force when manoeuvring the machines. Another highlight is the hydraulic blade shaft drive allowing infinite speed control during operation. The new flat saws are fitted with a tiger-eye guiding attachment that overcomes the need for conventional blade pointer assemblies. All machines are fitted with slurry control guards as standard, guaranteeing almost 100% clean up during cutting. Traxx Construction Products has been appointed the global distributor of the new saw range.